To do this exercise you will need a mat, a magic circle, and a foam roller. Start by lying on your back with your pelvis on the log. 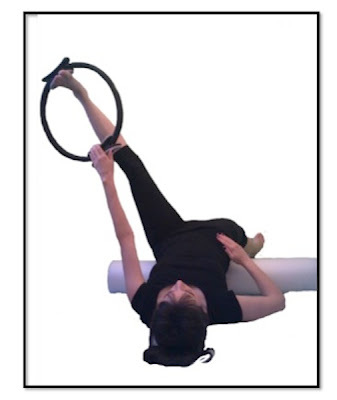 The log is perpendicular to your spine and one foot is planted in the ground with the knee bent and the other leg is in the air with the magic circle hooked around the ball of the foot. Your hand holds the other end of the magic circle. As you exhale lengthen both legs away from the midline. The bottom leg will remain on the floor and the top leg will remain in the air and each leg will move away from the midline of the body. Inhale as you bend both legs and then exhale as you lengthen both legs away from the midline. Repeat several times and then switch sides. As with all exercises that are intended to open the hips it is important to keep the pelvis neutral or in a slight posterior tilt to protect the back. This will also insure that you are getting as much length in the front of the hip as possible.